I have to admit, I love to shop. Actually, I used to love to shop but lately I find myself less inclined to be out among the masses and much more happy to shop with the click of a mouse. There are obviously no lack of places to shop online and my current addiction is collars. No surprise there, I’m sure. You may recall that Ray got two new Raven’s collars earlier this summer from Collar Mania and I loved them so much that I worked with them to get a very special collar just for Julius. I knew when we named him that he would be getting a special collar and I knew exactly what it would look like. The problem was finding it. Left, right, front…they’re all my good side. 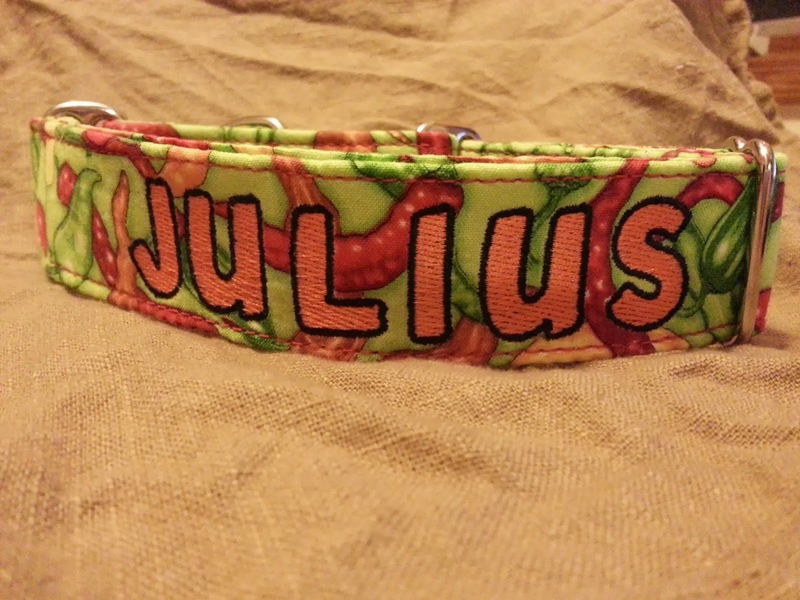 Fortunately, Lisa at Collar Mania worked extensively with me and found the exact fabric that I had envisioned and suggested a great font style and color to come up with the collar I had in mind. If you’re a football fan, will probably know the meaning of he collar, and if you are E. and Mr B. you should absolutely get it. Ray is always available for a photo bomb. All I can gush about say is that I absolutely love the color against his shiny black fur and the fun feel of the collar overall just makes me happy. If you haven’t checked them out, I highly suggest you do so. Today. I knew it was a new collar from your photo yesterday! And even though I'm not a Bears fan, I got the meaning of the fabric choice!! Such a beautiful collar! 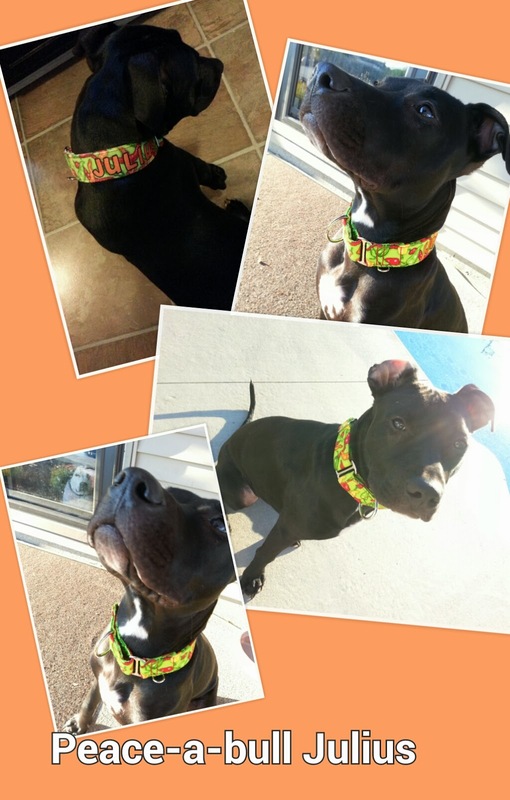 Awesome collar! I got the meaning right away! Awesome! 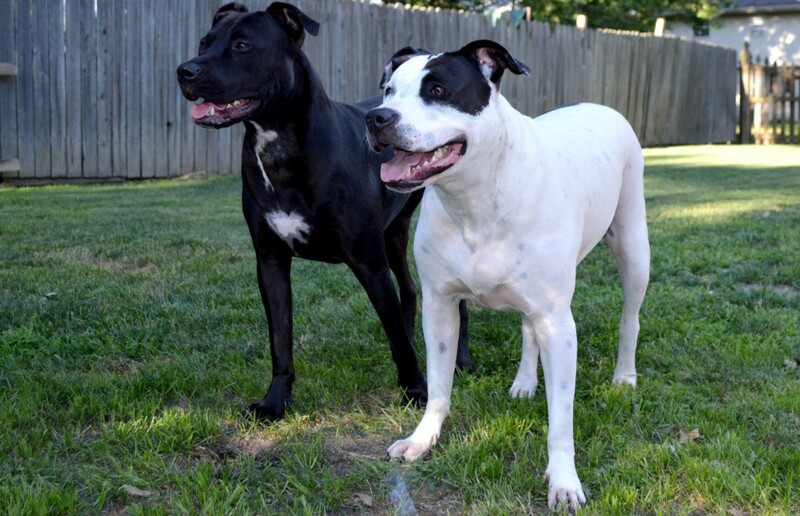 I love buying stuff for my dogs too and I have to control my addiction:/ Black dogs are so fun to pick out collars for! Julius just needs to catch up to Ray-Ray in terms of number of STUFFS… so… he's got a ways to go! 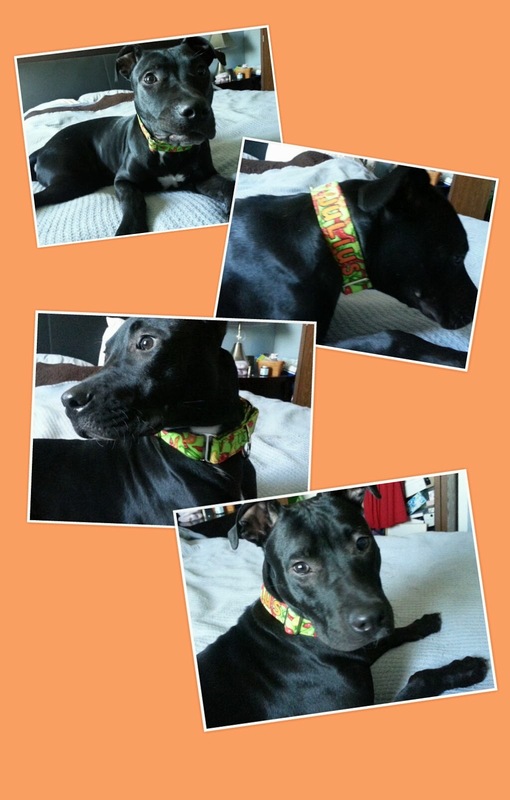 Love his new collar – so cute! Internet shopping has made it waaaayyyy too easy!! 🙂 I think you've inspired me to order the boys Colts collars for this season! What a lovely collar, it really suits him! That is seriously the perfect collar! LOVE! And me loves to shop so I shall check these out!